Twitter is the bone a social media. It is a part of a structure in social media without which you can not join up the social audience. When it comes to social media we got a lot of options such as those popular once like Facebook, Instagram, YouTube, Tumblr, Pinterest, Google+, LinkedIn and many more. Each year 100s of social media sites are launched by taking the goal of engaging social interaction and make them stay to built-up a great social media site. Unfortunately, 99% of them fails due to the similar concept of engaging them in the same stuff. Instead, people do love spending time on these popular social media sites where they have many features and functionalities to manage their account and has trust in them because of being such old sites. In social media, there are also variations of them which tend to the way interaction with people on that social media site. And when it comes to exposure in the market then twitter is best. Usually, the ratio of trust on twitter is higher than Facebook where lot of fake ids exist and people can be engaged in scams easily. Whereas Twitter is much of a professional media, where people do serious talk of info sharing and believe in having followers because of their tweets instead of messaging. Even celebrities and V.I.Ps do trust twitter and go for it first than facebook and other social media. But Twitter privacy is another big factor and lots of Twitter accounts hacked every year, due to their respective owner’s mistakes. One big mistake we do here is by logging our twitter account on other peoples devices. 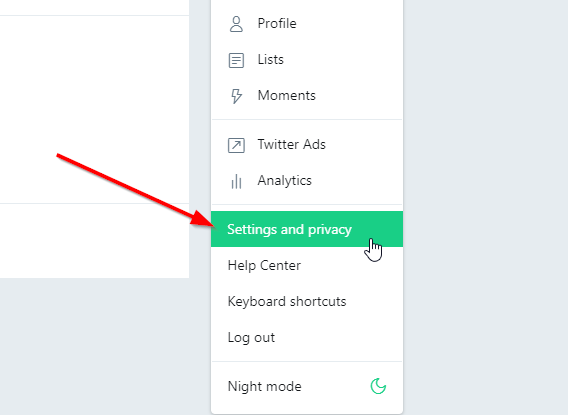 Borrowing other people(friends, family, colleague) device because of not having access to your personal computer or mobile device where you logged in your Twitter account is not a good practice to improve your twitter account privacy. On the top right corner and before the tweet button, you will see profile icon, click that. An option list will appear, choose Settings and privacy. On Account settings window, click on Password option from the list given on the left-hand side. Type the current password in the first box and then put the new password in other two boxes and hit Save Changes. If you are familiar with these 5 steps given above then you should make a habit to change your password once in a month in any case. This will ensure your security of your account. Also, do remember to use a standard password everytime you change it. People often use such passwords which are easily recognizable and crackable. If you still wondering which format of password to use or not then check out below explanation. These password examples will surely help you to increase the security of your Twitter account by letting you create the strongest password. If you are into setting your account password as a similar number in sequence then your twitter password can be easily cracked and your account will be hacked by anyone, all they need is a username which they can easily get through your profile. Even there is no need of using any tools, an attacker will first check this format of the password. And you will probably recognize what will happened next. Thinking to set a password as given one because of your comfort to remember a password then your account is in serious danger. Even your friends will once try to log in your account by thinking this given password sequence. Now, this is the format that 80% of people do use. This is a very common format of password, in which you use a combination of Capital and Small letter of alphabets. This combination of a password in which you use Capital and Small letter of alphabets along with numbers, is considered as a strong password. On the list of the strongest password, this the best example of a password that you should use. This combination of Alphabets(Small+Capital), along with the number and special characters is the only best example of password we see. These type of password can’t be hacked easily. if you use such password then you are safe out there but do remember to change it often at least once a week if using in different devices otherwise once a month. These 4 examples are the best of ‘what to” and “what not to” for the time while need to change or create a password for either new account or changing previous twitter account password. Also, it is not necessary to use a separate length of a password, you should make it more lengthy to embed more security on it. However, using lengthy password will surely not going to help you if you don’t use a strong combination of alphabet, numbers and special characters.